Viganò must be taken with a large grain of salt – it becomes clear he is ideologically driven and fixated on homosexuality – which is not the core issue here, though it has its place. His tone develops from factual and well-reasoned to one of taking advantage of the crisis to smear names that don’t deserve it (e.g., Cupich is “ostensibly arrogant”?? Francis had a ‘deceitful way’?? BS). Some of the cardinals he seems to list for no other reason than that they were appointed by Francis, and Francis he imposes sneering and snide comments on without justification. He was unhappy with his job placement, and has a mixed record. He has personally tried to quash an investigation into a bishop who facilitated and covered up abuse, that whole Kim Davis meets the pope debacle, and a number of other moments. (Which alone does not mean we should dismiss everything he has to say, but acknowledge that it is not at all an objective or proven claim). But if you can keep all that in mind, that he names names and shares what he knows (even if it is tainted by his bias) is nearly a good example. The dirty laundry must be aired in order to be cleaned. But it would have been better had he stuck to facts rather than gossip, innuendo, and whining. b) Benedict may or may not have acted regarding McCarrick, but if he did, he did so secretly and late, and this is the crux of the problem. What good are ‘sanctions’ if no one knows about them? Benedict’s record on abusive priests was good as pope, but with regard to bishops and cardinals he did nothing. Another fail. c) Francis is loyal to his friends to a fault, and just telling him about someone (Barros, McCarrick) is not enough, without evidence or clear first-hand testimony. This too is a failure. d) Viganò’s ire seems motivated by other reasons. As a schemer, he sees scheming behind everything, even if it isn’t there. His wholesale attack on Francis and everyone connected to him is not justified by the facts he presents earlier, but there are some legitimate questions raised. The pope resigning is not one of them. e) There is a whole list of curial cardinals and other bishops who ought to go. Just maybe not the whole list Vigano complains about, since some of his assertions are little more than gossip and retribution, the rest are documented and valid. It would be better had he not mixed the two. He names a dozen people who should have known, by virtue of their office, of these sanctions – none of whom have confirmed Viganò’s account. Some appear serious and well-founded: Bertone, Bootkoski, Myers, Sambi, Sodano, Wuerl. Most seem just to be speculation at best, and ideological mudslinging at worst. These probably should have been left out entirely, if he wanted to be taken as a straight shooter: Coccopalmerio, Paglia, O’Brien, Martino, Farrell, O’Malley, Cupich, Tobin, Martin. To that end, yes, there should be an investigation into the McCarrick affair, into the US bishops broadly, and into Viganò. It is after all the pope – as well as the People of God – who have been asking for honesty, transparency, and reform. This kind of ideologically driven rant does not help, but it does not mean that there is not something worth including in an investigation here. August is normally a quiet month in Rome. A month ago today, Pope Francis accepted the resignation of Theodore McCarrick, 88, from the college of cardinals. And that was merely the beginning. When it became known in 2013 that Cardinal Keith O’Brien (Scotland) was found, like McCarrick, to have engaged throughout the 1980s-90s in the abuse of power, sexual misconduct, and sexual assault of adults under his authority, Pope Benedict (who would announce his retirement a few days later) finally accepted his retirement as archbishop, and allowed him to go on retreat for a period of “spiritual renewal, prayer and penance”. Ostensibly on his own volition, O’Brien choose not to participate in the conclave the following month, but there is no indication that there were any sanctions imposed on him as a cardinal by Benedict. Only after Francis was elected was a visitation and investigation initiated – again, something unprecedented – and when the results of the investigation landed on Francis’ desk, O’Brien was he relieved of the “rights and duties” of a cardinal, though he still remained a cardinal, entitled to dress and be addressed as such. It was a bizarre half measure, some attest to Benedict’s intercession. When Cardinal Bernard Law was found to have covered-up sexual abuse by priests in Boston for years, and his resignation from that post eventually accepted, Pope John Paul II gave him an honorary post as cardinal-archpriest of the Basilica of Santa Maria Maggiore in Rome and allowed him all the rights and duties of cardinal, with a great deal of influence in the Roman curia for several years to come. Benedict did not change this, allowing him to continue unabated until retiring at the age of 80 from these roles. We can only imagine how many other cases there have been without any public action on the part of popes at all. Now comes this letter of former nuncio to the U.S., Archbishop Viganò, claiming, among many other things, that Pope Benedict had in fact placed McCarrick on some kind of (double secret) suspension, but that Pope Francis had allowed McCarrick freedom again, and for this reason he should resign. (More on that later). Pope emeritus Benedict has not, as of this writing, said anything about them, nor has Pietro Sambi, who was apparently responsible for communicating them to McCarrick. Pope Francis apparently trusts our ability to read critically enough to see Viganò’s letter for what it is, and no more. It seems unlikely that there were any such restrictions, except perhaps the request to move out of the seminary. First, if such sanction existed, the failure to make them public would be a grave scandal in itself. “Secret” laws are no law at all, and one of the issues at the heart of this ongoing scandal is the lack of transparency. In which case, yes a pope would be morally at fault for failing to act appropriately, and for covering up knowledge of an abuser. But that pope would be Benedict, not Francis. It does not stretch the imagination much to think that the old guard would have thought this an acceptable solution: McCarrick was elderly, no longer a threat, and already retired both as archbishop and on curial dicasteries. Let him meet his maker without another public scandal. Very Romanità. Very much the kind of thing Francis has decried since the beginning. Even if this were the way it played out, wrong though it might be, that would not be reason enough for Benedict to resign (though he eventually did). It would be reason to confess his error, correct it, and never do it again. It certainly is not a reason for Francis to resign. But Ockham’s Razor suggests that most likely, there never were any formal sanctions. Certainly, both Pope Benedict and Viganò “violated” these sanctions if there were, concelebrating mass with McCarrick, being at public events with him, and saying and doing nothing about it. What is more likely is simply that McCarrick was told to sell his beach house and stop spending summer vacations there with seminarians (done in 2000) and then, in retirement, not to reside in the seminary. Which he did. And that’s about it, as far as ‘sanctions’ seem to have gone, until Pope Francis acted. The culture of secrecy that pervaded the Church up to and including the papacy of John Paul II, only slowly began to crumble under Benedict XVI, and finally being torn away by Francis, is part of the clericalism that allowed this filth to spread thoroughly through the House of God. As with any serious housecleaning, things get messier before they get organized, the dirt becomes more visible – but you don’t blame the cleaner! As with anyone shining the light of Truth into dark corners, those who prefer the darkness will do anything to put out the light. No ‘faithful Catholic’ thinks the pope is a heretic. And, in general, to all related topics. The only people being called schismatic are schismatic. Causing division in the church is schism. Promoting it is schismatic. Being a member of a schismatic sect,¹ like the SSPX, is schismatic. Granted, they are in real but imperfect communion, like Protestants, or Old Catholics, or Anglicans – being in schism does not mean completely cut out of the Church of Christ as some seem to think – but when you actively divide the church, that is schism. Call a spade a spade. The voices that proclaim the pope a heretic *are* a radical fringe. Not of “nobodies”, but then nobody said that they were. It is not, however, a mainstream Catholic view. It is not even a view that can be labelled “conservative” or “traditional” or “orthodox”. It would be a disservice to many faithful Catholics who identify themselves as any of these things to lump them in with the small number of folks so accusing the pope. For most Catholics, Pope Francis is the first in decades actually speaking a language they find very clear. John Paul II was great with imagery, with stage presence, but his writing was dense, everything wrapped up in layers of personalism or phenomenology. Benedict was brilliant, and as a theologian I loved how much more clear he was than JPII, but it was not the language of most Catholics. Francis speaks to most Catholics, and has the greatest clarity of the set. The only “confusion” has been created not by him, but by his critics, or perhaps by their rather poor formation either in the development of doctrine, the hierarchy of truths, or moral theology in general. Certainly in ecclesiology. In fact, it is precisely the idea that we must be open enough to dialogue, to engage a variety of traditions, and even to accept that there is not always a centralized, universal answer to everything that is the hallmark of not only Francis, but the broad swath of faithful who do not identify with the radical fringes – whether “radical traditionalism” or “radical feminism” or “radical ecology” or whatever. People critiquing a papal document, or, in the case of AL, a papal-synodal document, is also a hallmark of this tradition – of a great Catholic tradition of dialogue, of the great both/and – rather than that of fundamentalism. But, the question is, how do you tolerate the intolerant, or dialogue with those who refuse dialogue? If there are any honest critics of Pope Francis, let them disassociate themselves from the radical fringe of sedevecantism, SSPX, or calling the pope a heretic. Let them disassociate from deliberately dishonest media like Church Militant or LifeSite News, who seemingly exist only to agitate against the Church, under false pretenses, like wolves in sheep’s clothing. For St. Peter’s sake, let them stop hammering on about the dubia. In what papacy has anyone ever demanded the pope answer dubia? At what time has anyone, with any other pope, been so arrogant as to think they had the right to do so? For that matter, it has barely been a year since the dubia were submitted – when was the last time anyone in the Vatican answered dubia in less time than that? The lack of respect for the bishop of Rome is breathtaking. It is one thing to say, “this is unclear” or “I do not understand this”, another to say, “because this is unclear, only the pope can clarify it, and he must do so on my timetable” or “because i do not understand, it must be heresy”. It is one thing to ask questions, engage in debate, and have dialogue – it is something else to foment discord, deliberately spread confusion, encourage disrespect of the magisterium, and threaten to divide the Church. “Faithful Catholics” do not do these things. If I were a priest, I could probably afford the $795 that NACPA is charging to download a copy of their full study, and find out in closer detail. 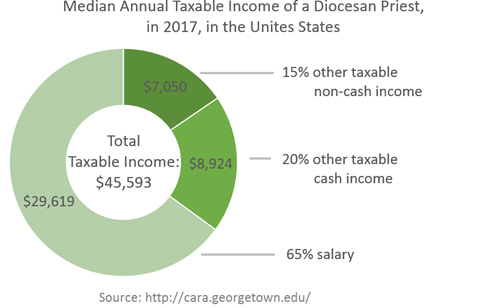 But as a lifetime lay employee of the Church, I have to take it as a given that the good people at NACPA (mostly lay pastoral administrators) have crunched their numbers accurately and the $45,593 is in fact the median taxable income of U.S. priests. A table of contents is publicly available which indicates what they did (and did not) consider. What about the untaxable income? What about the things that are hard to quantify but observably make a difference? Or easy to quantify but simply taken for granted? What about the expenses that the lay counterpart has that the priest does not? A penny saved is a penny earned, after all. A pastor I know complained – often and loudly – that he was paying the lay pastoral staff at his new assignment far too much (A little less than $50,000 per year, less than the state’s average income). To his credit, the pastoral council president, who had been involved in the hiring process with the previous pastor, usually replied that the staff were paid about 1/3 of what they were worth in the private sector, and the young priest should be a little more appreciative. Fr. Scrooge’s attitude got me thinking about the apparent disparity between compensation for equally qualified people with a vocation to ecclesial ministry. Look at two people of reasonably comparable demographic – single, no children, with undergraduate and graduate degrees in theology/divinity, committed to a life of ministry in the Church – and consider them in a similar parish, similar ministry, with similar qualifications, experience, and responsibility. One is a priest, the other a lay ecclesial minister. There is no question the priest in such a scenario is “wealthier” – enjoying a higher standard of living, a nicer house, with greater stability, and less stress about making ends meet. So how does this observable reality reconcile with the apparently low income that priests have, according to the NACPA study? Something is missing. Considering a few major areas of disparity, we can easily track how those pennies add up, taxable or otherwise. In the U.S., the standard education and formation program for a priest is to have a four-year Bachelor’s degree (in anything, really, but with a year’s worth of philosophy and theology at the undergrad level before graduate seminary), and a three-year Master of Divinity or equivalent, plus a pastoral internship year. Most lay ecclesial ministers have something similar, if, of necessity, in a greater variety of configurations. In one diocese I am familiar with, the entire cost of seminary is covered, at least from pre-theology onward, plus a variable stipend for travel and spending. For college seminarians, the students are accountable for half their cost (which could be covered by scholarships they earned from the university, for example). The average cost of tuition and fees at Catholic colleges and universities in the U.S. in 2016-2017 was about $31,500, with the highest ones being around $52,000 (Source: ACCU). So let us say the diocese i mentioned is typical, and pays for two years of the undergraduate and all three years of the graduate costs for formation: middle-of the road estimate of $157,500 per seminarian. An additional spending stipend can range from $2000-$6500 per year depending on where they are in studies. Let us say $4000 a year for ease of calculation. An additional $20,000 brings the educational investment up to $177,500. It would be interesting to see what the actual numbers on this spending are. The candidate for lay ministry, on the other hand, has to work or take out loans, though in some places some assistance is available. Forty years ago, one could work full time at a minimum wage job in the summer to pay for a year of tuition at a respectable state school, but that has not been true since the 1980s. Despite savings, work-study, scholarships and grants, and, if fortunate, parent contributions, the average graduate leaves with $38,000 in student loan debt after a Bachelors, and about $58,000 all told if they have also a Masters from a private institution, which has to be the case if you have a degree in theology. (Source: Newamerica.org study, Ticas.org). The interest on that, at the standard federal rate of 6% over the life of the loan (twenty years) will add another $19,000 to the total. So far, in terms of pennies saved and earned, the priest is $196,500 ahead, and ministry has not even begun. But we are not done: the best and brightest are often called to graduate studies, say, a license in canon law or a doctorate in theology. Another three years of graduate school for a JCL (or five, at minimum, for a doctorate). In Rome, where tuition is cheap but living is costly and jobs are hard to find, it is easy to contrast the stability and support given to clergy with the complete chaos experienced by most laity – who, nevertheless, sacrifice more and more in answer to a vocation to serve the Church. About $25,000 a year, (choosing the cheaper options of a canon law degree in Rome), and there’s another $75,000 where our priest has uncounted ‘income’. He is now $271,500 better-off than the lay counterpart …and we are not even counting the little extras Knights of Columbus ‘pennies for heaven’ drives or Serra club gifts. 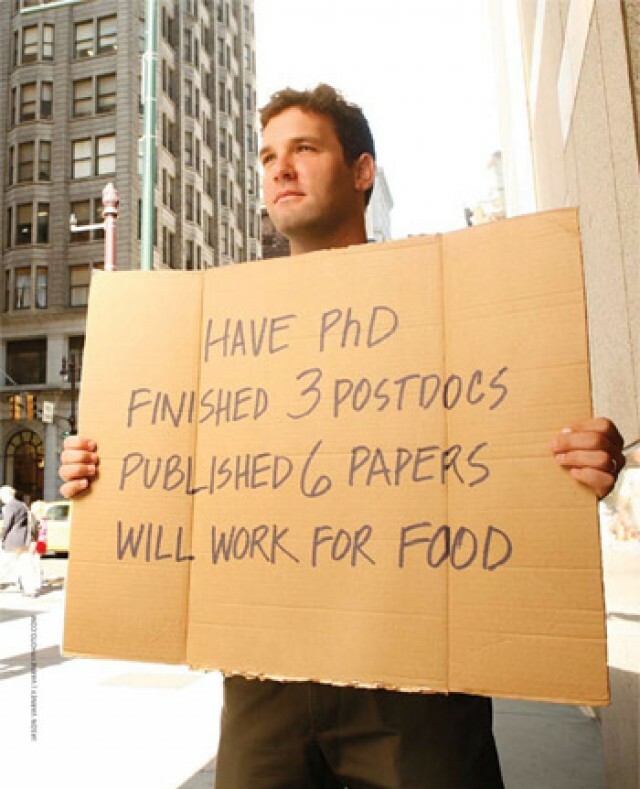 Note, too, that the priest-grad student continues to draw a salary/stipend, plus other benefits like housing and food stipends, while in studies; the lay minister has to give all this up to pursue studies. According to the study, that means adding another $45,000 per year to the priest’s advantage. So, make that $406,500 ahead of the lay minister with the same education. St. George Parish Rectory, Worcester, MA. Housing was calculated in the NACPA study, either (or both?) in terms of taxable cash allowances and housing provided, but it is hard to reconcile the low-ball numbers given with the observable reality: Priests living alone in houses that are considerably larger and/or nicer than what their lay counterpart could ever afford to live in. How is this possible? Simply ask the question: What is the value of the house (rectory) and what would it take to live there? You can either look at the value of the rectory and estimate the salary required to afford such a place; or you can look at the salary earned and look at how much house someone with that income can afford, and how it compares. Based on the 2012 CARA survey (being unable to see the 2017 median salary as it is behind a paywall), the median annual salary in 2010 was $34,200. That’s about $38,351 in 2017, factoring for inflation. Assuming no other debts (ha! ), that means one could afford a house valued at about $185,000, considerably less than the median price. The median house value is about $300,000 in the U.S., based on sales prices over the last year (Source: National Association of Realtors). To afford this, one would have to be making about $65,000 a year, at least, and paying $1800 a month mortgage or rent. But is the typical rectory more or less expensive? As a point of reference from which to extrapolate, I checked on the value of the rectories in the five parishes where I have lived and worked in the last twenty years. (Source: Zillow). I then compared their value to the median house value in the same cities or regions. Estimated monthly payment: $3560. Recommended income: $120,000 per year. Estimated monthly payment: $4366. Recommended income: $146,000 per year. Estimated monthly payment: $4480. Recommended income: $150,000 per year. Estimated monthly payment: $6051. Recommended income: $202,000 per year. Estimated monthly payment: $10,281. Recommended income: $343,000 per year. The average rectory value was $888,400 in a region where the average house is valued at $514,000 (or, 172% the price of a ‘median’ house). Only in one case was the rectory valued lower than the typical house, and in most cases they were considerably higher. One would have to be earning an annual salary at least $192,200 in an area where the median household income is $58,000, in order to live in these rectories – and most Church employees are not even making the state median income. Extrapolating this trend to the national median house price, we could estimate that the national typical rectory is valued at about half a million dollars, meaning a mortgage or rent of $3000 a month for the lay employee wanting to buy or rent the same place. An additional $36,000 a year is well beyond the taxable extras indicated by the NACPA survey. The main reason for this is probably that many of the properties are already owned in full by parish or diocese, so the cash flow is calculated differently, but to my question: what would it take for the lay employee to live there, this is the more accurate measure of wealth differential. Our priest is now not only $406,500 better off to begin with, but at an advantage of $36,000 per annum. On average. In a place like western Washington State (where my rectory examples are from), the annual disparity is nearly double. These days, it is not unusual to be without work for some period of time, no matter how educated, skilled, or driven one is. Though Baby Boomers tend to think of these as irregular, it is an expected part of professional life for GenX and Millennials. About 1 in 5 workers are laid off every five years, in the twenty-first century, and 40% of workers under 40 have been unemployed for some significant amount of time in their short careers. I can only imagine this statistic is higher for those who have worked (or tried to work) for the Church. When a priest is incompetent, or just not a good fit for a particular job or office, it is almost impossible to have him moved or fired. Even when he does, his livelihood is never in question. Even when a lay minister is at the top of his or her game, an economic downturn will affect them far before the priest. Our exemplar lay minister not only has to worry that he could lose his job just because the new pastor does not like lay people or feels threatened by anyone with a theology degree besides himself, s/he has to worry about more than just a loss of respect or office, but something as simple as whether or not he can afford a place to live, health care, or the cost of moving to a new job. Lay ministers are not even entitled to state unemployment benefits, being employees of a religious institution. If he or she is out of work for a month or two, that means a significant loss of income and increase in stress, not vacation time. How do we quantify this? Certainly, the psychological advantage of knowing you have virtually untouchable job security is priceless. Based on some (admittedly unscientific) survey of other lay ecclesial ministers, an average seems to be about one month of (unpaid, involuntary) unemployment for every three years of working for the Church. Based on the median annual pay and benefits of such ministers, that’s a little more than $4300 in lost income and benefits every three years, or about $1450 a year we can add to the priest’s income advantage, which now stands at $406,500 out of the blocks and $37,450 annually. Whether he meant the he was paying out of his own pocket for our dinner but realized his salary came from parish giving, or that he was using the parish credit card (and budget) was a little unclear, but it seemed like the latter. Even the most well-intentioned priest is hard-pressed to clarify where his personal finances begin and the parish’s ends in every case, especially as he has essentially full control over the latter, what with most parish finance councils being merely ‘consultative’. For those who feel they are entitled to the benefices of their little fiefdom, it is only too easy to meet basic needs without even touching one’s official salary or stipend. Sometimes it is a result simply of not knowing any other way. When I was a grad student, the then-chair of theology was a Benedictine monk. At the end of my first year, he called me in to inquire why I, as a scholarship student, was not getting straight A’s. When I mentioned the 25-30 hours I put in at work each week, he was perplexed: why was I working while in studies? I pointed out that my scholarship covered only tuition, and not university fees, housing, food, insurance, travel and transportation, books, computer, etc., he sat back and with a rather distracted look on his face said, “Oh… I forgot about all that.” Such is the advantage of the ‘wealthy’ – even in vows of poverty! I cannot calculate the untaxed income of intentional or innocent blurring of boundaries between budgets, but we would be naïve if we did not realize that our current quasi-monastic compensation structure lends itself to confusion at best, and abuse at worst. Certainly, most priests are among the well-intentioned and conscientious in this regard. That does not mean we cannot improve. Fifteen years after ordination or the beginning of a career in ministry, our two Church ministers are sitting quite differently. Nearly $970,000 differently, in fact. Our priest started with $406,500 in education advantages, and enjoyed housing and security advantages at a rate of $37,450 per year. In other words, in order for our lay ecclesial ministers to be living on par with our priest – their average salary should be about $96,000 per year (plus benefits) – nearly triple the current reality. (Calculated by dividing the education advantage over twenty years, and adding the annual advantage to the average annual pay). Remember, this is not all cash in hand, or the kind of wealth you can take with you (I know most priests do not own the rectories in which they get to live, but then, most lay ministers are renting too.). Nor is this all of the same quality information – some is based on extensive national study, but where data is lacking, we have had to estimate a median goal by extrapolating from known reference points. Obviously, that means i will continue to update the figures up or down as more or better information presents itself. But in terms of, “what would the lay minister’s salary have to be to enjoy the same ‘wealth’ as a priest” there is your answer. These are expenses the priest never personally had, that the lay minister did or would have to have had to live in the same houses, have the same education, etc. So how can we make our compensation structure more just, more transparent, and more equitable? The detailed information in the NACPA study helps, but it only address some of the problems. Accounted taxable income is only a portion of the income disparity, as we have seen. So what could we do differently? Perhaps when a bishop or pastor hires a lay ecclesial minister, he should compensate them for the education they paid for that he now gets to take advantage of, to the same degree as what he would have paid for a priest in their situation? How does a $406,500 signing bonus sound? At the very least, compensate the individual as you would a fellow bishop when a priest from his diocese is excardinated from there to join yours. I am a big supporter of the idea that all of our ministry personnel – presbyters, deacons, and lay ecclesial ministers – should all follow the same compensation system and structure. Preferably, a straight salary. This clarifies the boundaries, makes real tracking of compensation easier, and clarifies comparable competencies. Wherever the Church wants to remain in the real estate and housing business – though i am unsure if it should – these should be administered at the deanery level and set up as intentional Christian communities for ministers. Will have to write something else about this. The same should be said for support and funding for formation and education. When the majority of parish ministers are lay ecclesial ministers (which has been the case for over a decade in the States), the majority of funding should be going to support their formation. The same is true for advanced studies. Too often bishops seem to forget that their pool of human resources is wider than just the presbyterate. Raise up talent wherever it is found, and you will find dedicated ministers and coworkers for the Lord’s vineyard. Years ago, I met a young woman who wanted to spend her life in service of the Church, and so was pursuing a degree in canon law. She had written dozens of bishops asking for some kind of support or sponsorship in exchange for a post-graduation commitment to work, and received only negative responses. Her classmates were all priests ten to twenty years her senior, most of whom had not chosen to study canon law, and all receiving salaries in addition to a full ride scholarship from the diocese. When she and I caught up ten years later, half her class was no longer even in priestly ministry, and she was still plugging along, serving as best she could. Talk about potential return-on-investment! Hundreds of thousands wasted on priests who did not want to study canon law in the first place, a fraction of which would have yielded far better results with this one young lay woman. Imagine how many more are out there denied the opportunity to serve simply because not enough support is offered. You never know what it is that will catch people’s attention. I hoped this post would provoke some thought, at least among friends and colleagues who read my now very occasional postings, but never thought this would be one to run viral. Read 4000 times here, shared 900 times on Facebook (! ), quoted in America and prompting at least one blog in response, i have read and engaged many comments and am adding a follow up to those – many insightful – in a new post. This is the only one I had to make an estimate. Neighboring houses ranged from $800K to $1.5m, all of which were substantially smaller, on less property, and none of which featured an outdoor swimming pool… So I am, if anything, probably a bit conservative on the estimate. Every time the media, some blogger, or a friend on facebook lament the “confusing” effect of Pope Francis, Amoris Laetitia, or the gospel, they pull out the infamous dubia of Cardinals Brandmüller, Burke, Caffarra, and Meisner or the letter of 45 “theologians” sent to the cardinals critiquing or dissenting from the apostolic exhortation. (Really, only about 15 of the signatories are theologians, some of note, the rest being lawyers, philosophers, grad students and simple clerics). After Pope Francis did not respond to the call to explain his views, the four cardinals — including an American based in Rome, Cardinal Raymond Burke — released the text of their appeal. Burke also gave an interview saying the pope would automatically lose his office if he professed a heresy. In December, another group of 23 Catholic scholars and cleric issued a letter saying the church was now “drifting perilously like a ship without a rudder, and indeed, shows symptoms of incipient disintegration.” They urged the four cardinals to issue a so-called fraternal correction. There are 223 cardinals, only four (three retired) signed the dubia. It is a little hard to find statistics on just how many theologians there are, surprisingly, but a quick estimate* suggests something like 23,000 Catholic theologians (with a doctorate), worldwide. Only 15 singed this dissent letter. So, <2% of cardinals, and 0.06% of theologians have formally expressed criticism or dissent from Amoris Laetitia. Granted, it is always fair to assume that there are some whose sentiments are in accord with those expressed by did not or could not sign the letters, so there are larger numbers with similar ideas. But still. These numbers are tiny. Minuscule, even. No way do they deserve the level of attention they have been given. Though, the fact that they can do so is nothing short of amazing. Barely a decade ago, only tenured professors dared even utter words like “clericalism” or “reform”, much less things like “married priests” or “formal correction of a pope”. For an entire generation previously, criticism of, and even voicing differing opinions than, the pope was a good way to loose your job, damage your career, and guarantee persona non grata status on commissions or as curial consultors. Now, at least ,there is freedom to express yourself on such things without petty reprisals. The simple reality is the vast majority of people who know what they are talking about back the pope and the bishops. The vast majority of people who mostly know what they are talking about back the pope and the bishops. This should not surprise anyone. But it seems to, almost constantly. Perhaps because too large a voice is given to this cantankerous minority, and it has far too much influence here in Rome. Another three decades of Francis or another in his mold might just shift the paradigm, otherwise, more direct action needs to be taken to balance the perspective to match reality. Perhaps the press could help, by, instead of highlighting these fringe voices of dissent or doubt, focusing on the 219 cardinals and 22,985* theologians going along with the thought of the Church, hm? *There are 1358 Catholic higher education institutes worldwide, about 215 in the U.S. alone. Those 215 produce about 90 research doctorates in theology (PhD, ThD, STD) every year. That info I could find easily. So lets extrapolate and guess 570 PhD’s in theology worldwide, per annum (that’s possibly generous). But again, estimate 40 years of being in the workforce before emeritus status, and there are potentially 23,000 Catholic theologians out there. Not even counting those of us with DMin, STL, MDiv, MTS, MA, etc. And certainly not counting philosophers and sophists lawyers who think they are theologians! PS: I would love someone with accurate statistics on theologians and theology PhDs to come along and correct me, please. Married Priests? “Viri probati” and other challenges. Yesterday, Crux and others shared news that Pope Francis, in an interview with the German newspaper Die Zeit, had indicated openness to ordaining married men in the Latin Church. It is not the first time. Twenty, thirty years ago, one could safely bet that the world’s bishops supported the idea, but it was the pope who was opposed; now it seems to be the other way around. Who are these “viri probati”? What would be the effect on the diaconate? Why would “isolated communities” be better for married priests, or, why would it be difficult to “find what to do with them”? Viri probati is a red herring. Not that I have anything against the ordination of “proven men”, of course. However, all the ordained, not just the married ordained, should be “proven” or “tested” before ordination. To raise this ambiguous phrase exclusively in the discussion of ordaining married men, either to the diaconate or the presbyterate in the Latin Church, is potentially distracting from more serious issues. The standard should be the same for married and celibate men, in terms of formation and education, character and ability. It is unethical and unnecessary to set a higher bar for married clergy than for celibate clergy – or for that matter, to set a higher age limit. Who is “proven”? This phrase floats around with virtually no formal definition or context. If the practice of the diaconate is any indication, many bishops seem to think that it means retired volunteers without formal ministry formation or experience. That the “proof” is in a life of being a happily married faithful Catholic in a secular vocation. This is good, but it is insufficient, and better “proof” of being an active lay person in the Church than an ordained minister. If we are to turn to “proven men” we must think of the same people that the Council Fathers thought of as “already exercising diaconal ministry” (AG 16) as the first candidates for ordination to the diaconate. We ought to consider those men “already exercising presbyteral ministry” as candidates for the presbyterate. Look first to the lay ecclesial ministers, catechists, chaplains, pastoral workers, lay theologians who have committed their lives in service to the Church, whose vocation is already clearly ecclesial, rather than secular. They have already given years to the education, formation, and experience we want in our priests and deacons. Most often, they have done so at considerable expense and sacrifice to themselves and their families – usually, tens or hundreds of thousands of dollars’ worth, compared to “traditional” seminarians, who have been sponsored by the diocese throughout formation. These are your “proven men”. What of the effect on the diaconate? Because of the accidents of history and the slow, and often piecemeal, approach to reform and development in the Church, there can be no doubt that several men called to be presbyters have been ordained deacons because, and often for no other reason than, they are married. Similarly, there are men in the presbyterate who really ought to be deacons, but as celibates, were pressured into the presbyterate. I have long been convinced that we need more married presbyters and more celibate deacons. It is an error to believe that celibacy defines the presbyterate or marriage the diaconate. In their ancient roots, if anything, the reverse was more likely to be true. One’s vocation to ministry, and one’s vocation to relationship, are two distinct questions. Whenever discussion turns to the topic of restoring the discipline of a married clergy in the Latin Church, I envision disaster for the diaconate, if it is handled badly. We are only part-way through the process of restoring the diaconate as a proper order of ministry, full and equal to the presbyterate, of a lower “rank” than the bishop. As long as we still have transitional deacons, and the question of women in the diaconate is unsettled, we have not yet completed this process. As long as people still define the diaconate more sociologically – as a band-aid solution for a lack of priests, as a retiree’s volunteer ministry, as the holding place for married clergy – rather than a vocation and ecclesiologically essential order in and of itself, we are still a work in progress on the diaconate. Simply waking up tomorrow to a a married presbyterate would lead to an exodus from one order to the other without the balance going the other way. Though, perhaps this should be encouraged – a discernment of orders without the distraction of the celibacy/marriage dichotomy. Say, a ten year open period where anyone previously ordained to one order could ‘relocate’ to the other, if it fit more their calling. This would necessitate making clear what belongs to the deacon as the first assistants to the bishop: the diocesan curia, the deaneries, the diplomatic and ecumenical work, responsibility for personnel and finance, assisting in the governance of the church. The presbyterate is primarily an advisory group to the bishop, the local church’s ‘council of elders’. In short, deacons extend the bishop’s ministry (diakonia), as the presbyter extends the bishop’s priesthood, as cultic leader and presider at Eucharist. Related to this is the age of ordination. Canon law currently suggests that celibate candidates can be ordained at 25 while married candidates at 35 (CIC §1031). Recent discussion on raising the minimum age of presbyteral ordination to 27 have been entirely too modest. This double standard should end – a single, common minimum age for both orders and both states of life. All candidates, whether married or celibate, for deacon or priest, should be at least 35 years of age. As a seminary professor in Rome for the last few years, and from several years of working on lay ecclesial and diaconal formation, I have come to know a variety of candidates for ministry. In my experience, there is really no such thing as a “late” vocation, but I have witnessed many premature ordinations. Many of these prematurely ordained presbyters end up leaving, and/or doing great damage to the local church, not having been “proven” in any real way. This older minimum age would allow a testing period as lay ecclesial ministers, and/or in a secular vocation. I do not think anyone should be ordained who has not put in at least five years of pastoral ministry in some context. It would also allow for discernment between vocation to each order in its own right and on its own merit, questions of marriage/celibacy aside. It is not clear if this is a response to a question, or part of a larger comment. But it raises the spectre of a kind of ‘clericalism within clericalism’. What possible reason is there for restricting the ministry of married clergy other than an elitism of the celibates? 1) that more stable positions (such as parish pastor) would be a better fit to married clergy than more itinerant positions (such as missionary or diplomat) which might better suit a celibate. Many of the former are more presbyteral, as well, while the later tend to be diaconal, which is worth considering. 2) In those areas where persecution is a real threat – and here I think danger of a martyr’s death – there is perhaps more freedom in a celibate clergy. But this is not the case in many parts of the world. Perhaps in some communities or cultures a transition period will be necessary. I remember meeting a Filipino priest here in Rome who had never heard of the Eastern Catholic Churches, and had no idea there were married Catholic priests anywhere in the communion. He assumed all such were Anglican or Protestant. Or an American who was shocked at seeing her parish deacon, still vested, give his wife a chaste kiss after mass. These things have to be normalized, with charity and intentionality. That can take a little time, but not really that much. There is no reason to suggest that married clergy would only be useful in “isolated communities” but it is not clear yet if that is entirely what the Holy Father said or meant. He could have meant that this is one obvious example of need – in many parts of the world the Eucharist is not a daily or weekly liturgy, but monthly or quarterly, for no other reason than a shortage of presbyters. In such ‘isolated communities’ more priests, married or celibate, would be a great service to the local church. In most cases, there is no compelling reason to make such a distinction, between how and where a celibate or married priest might serve, and no burden or barrier should be placed without grave reason (cf. Acts 15:28). Finally, two other possible considerations, as long as we are rethinking the discipline of our ordained ministers. First, the Latin Church does not share the Eastern tradition of restricting the episcopate to the monastic (and therefore celibate) clergy. While there is wisdom in this discipline, there is also wisdom in the Western tradition of married bishops, who are called from, and in service to, the diocesan churches. Perhaps that is for later consideration, but we must face these questions with a full awareness of our own tradition. Second, since Nicaea, the Catholic/Orthodox Church has allowed ordination of married men but not marriage of ordained men. Yet there are apostolic churches that allowed marriage after ordination (e.g., The Assyrian Church of the East). This is also the almost universal practice of the other churches and ecclesial communities of the Western tradition. At the time this disciplinary compromise was reached, the normal age for marriage was as early as 12-14. Ordination might come a decade later, and life expectancy for those who had lived long enough to get married was about 45. It was obvious that questions of marriage would be settled before questions of ministry. Today, the reverse is true. In many contemporary cultures, one is expected to have completed education and established a career before entering into marriage. Following the logic that gave us the ancient discipline, it would almost make more sense today to forbid marriage before ordination! At least, we should reconsider this ancient discipline in light of the same sociological factors that inspired it. All of these questions need to be considered for their ecumenical impact, too, and the wisdom of experience from both East and West should be part of our discernment in revisiting these ancient disciplinary questions. If nothing else, we can be grateful for a bishop of Rome willing to entertain the question, no matter the result. I was interviewed recently by Christopher Altieri, host of “Thinking with the Church”, a podcast series started by the philosopher/Vatican Radio reporter earlier this year. The conversation ranges over a variety of ecumenical questions for just under an hour. Please check out the rest of the series, too, if you enjoyed our conversation. This is Vocaris Media, and you are listening to Thinking with the Church. In this edition: Part 1 of a conversation with a man who has dedicated his life to studying, praying, and working to achieve Christian unity. Andrew J. Boyd – “A.J.” to his friends – is Adjunct Professor of Theology in the Rome program of the Catholic University of America, as well as in the Rome programs of Providence College and Assumption College. He has taught short term courses through the Lay Centre at Foyer Unitas – the Rome center founded in 1986 and dedicated to the formation of the laity and to the promotion of the lay vocation in the Church and in the world, which also works to promote Christian unity and to create opportunities for genuine encounter and sincere dialogue with people of other religions. AJ has also worked with the sabbatical program of the Pontifical North American College. We’d known of each other for some time before we met “in real life” at the inauguration of the KAICIID dialogue foundation in Vienna in 2015. He is an extraordinarily thoughtful interlocutor – only, don’t let his soft-spoken demeanor fool you – he is capable of giving as good as he gets in any discussion. Don’t take my word for it, though. Let AJ get us rolling with his take on what the ecumenical project is. That was Part 1 of a two-part conversation with ecumenist AJ Boyd. We’ll bring you Part II next week. Indeed, one of the surprising things for me has been the discovery of how fervently Christians of other confessions also believe in the Four Marks: that the Church is indeed “One, Holy, Catholic, and Apostolic” – however different their understanding of what the marks indicate and what it means to profess them – because – I must confess – I cannot understand caring about the Marks at all and not being instantly and therefore Catholic. So this fellow, who grew up in CatholicTown, USA, and has spent almost the whole of his adult life in Rome, is on a pretty steep learning curve. In all this, “The revelation of Christ will continue to be ‘the true lodestar’ in history for all humanity. (Ibid. )” Dominus Iesus – a much maligned and deeply misunderstood document, supposedly one-sided and heavy-handed, ends with an almost mystical vision taken from the Fathers of the II Vatican Council. The Christian mystery, in fact, overcomes all barriers of time and space, and accomplishes the unity of the human family: ‘From their different locations and traditions all are called in Christ to share in the unity of the family of God’s children… Jesus destroys the walls of division and creates unity in a new and unsurpassed way through our sharing in his mystery. This unity is so deep that the Church can say with Saint Paul: ‘You are no longer strangers and sojourners, but you are saints and members of the household of God’ (Eph 2:19). – Ibid. It’s not by accident, I think, that Joseph Cardinal Ratzinger concluded his doctrinal note on the relation of the Catholic Church to other Christian Churches and ecclesial communities and other religions, with just these quotations from the then-recently-published Fides et ratio. It is as if he were recalling us to the task set for us by Peter in his first letter: to give a reason for the hope that is in us. I’ve told the story before on this podcast, about how a friend once asked me why I am Catholic – or why, after all, I am still Catholic? I am Catholic because the Catholic Church is true. The Catholic Church is the One Church founded by our Divine Savior, Jesus Christ, as the vehicle by which humanity is redeemed from sin and death, and restored to friendship with God. The Church is the efficacious sign of that friendship. I am Catholic because I would be reconciled to God, and to all my fellows, and at peace with all and every one, and the Catholic Church promises this. For now, I see this through a glass, darkly, in a darkness the brightest spots of which are often but the dimmest glimmers of hope – though I am told this is a hope, which does not disappoint. Why am I Catholic? Let me answer with Peter: where else shall I go? Friends, the podcasting arm of Vocaris Media is listener-supported, so, your donations really are what makes this possible. $1 / show is what we ask – though we’re always happy to receive more. You can make your donation by going to the blog – www.thinkingwiththechurch.wordpress.com – and click on the “support TwtC” tab in the menu at the top, or by going to www.vocarismedia.com and looking for the “donate” button in the top-right corner of the page. You can participate in discussions by going to the blog: again, that’s at www.thinkingwiththechurch.wordpress.com and leaving your thoughts in the comboxes. Subscribe and leave us a review on iTunes, or use the RSS feed to subscribe through your favorite podcast manager. “Thanks!” as always to Executive Producer Ester Rita. Our web guru is Christopher Bauer Anderson – “Topher” Anderson of www.lifesiteministries.org. Sean Beeson composed our theme. Hear more of his musical stylings at www.seanbeeson.com. St. Gabriel Archangel, pray for us! The Assyrian Church of the East grew out of the Nestorian tradition, which affirms that Christ existed as two persons – one human and the other Divine, to which one of the exaggerated responses was Monophysitism – the idea that Christ had only one Divine nature, either because His human nature had been subsumed by His Divine nature, or because the Divine mind somehow replaced or supplied Christ’s human reason in the Incarnation. Both Nestorianism and Monophysitism were condemned by Church Councils at Chalcedon et passim.